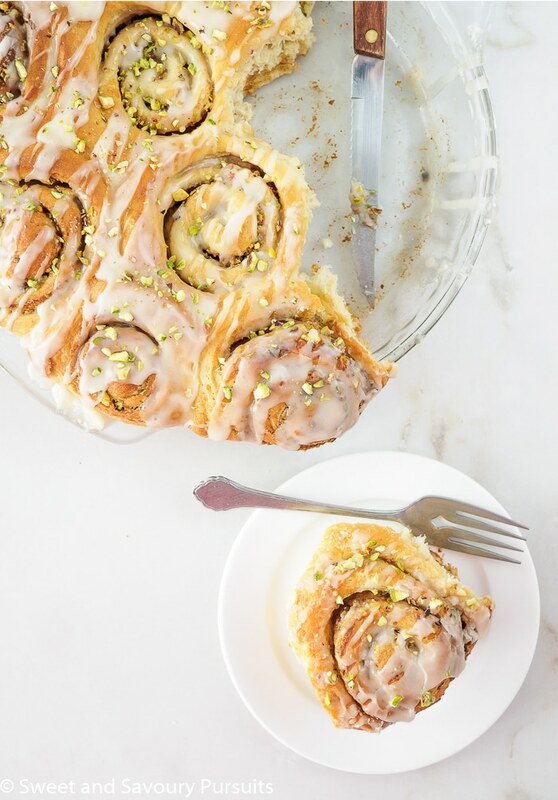 These Sweet Tahini and Pistachio Cinnamon Rolls make a special breakfast, brunch or dessert treat that will quickly become a favourite! I can’t tell you how long I have wanted to make cinnamon rolls at home. Unfortunately, I let my apprehension of using yeast get the best of me and always told myself I would try it later. Well, I’m here to say that I have finally put this silly yeast fear out of my head and have successfully made two gorgeous batches of cinnamon rolls! 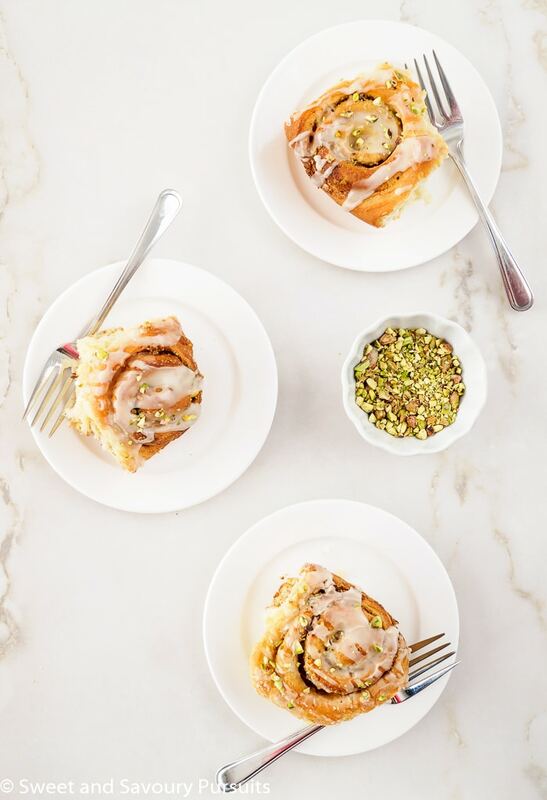 In just a few simple steps you can have gorgeous, delicious and fluffy sweet tahini and pistachio cinnamon rolls freshly baked at home. Don’t let the yeasty dough intimidate you these are easy to make even for beginners! The truth is I didn’t just make cinnamon rolls, I made Sweet Tahini and Pistachio Cinnamon Rolls. I’ve had the urge to combine tahini, brown sugar, spices and pistachios into a pastry for some time now and I’m so glad I finally did. The result was delicious, the rolls are tender, fluffy, flavourful with cinnamon and cardamom, and perfectly sweetened. The glaze isn’t necessary but if you like baked goods on the sweeter side then you’ll want to drizzle some over these heavenly rolls. There’s nothing like the scent of fresh cinnamon rolls baking in the oven. And if you make these and happen to have leftovers you can wrap them up individually in foil, and store them in a freezer bag in the freezer. This way whenever you fancy a roll you can take one out and enjoy with minimal effort, simply warm the roll still wrapped in an oven or unwrap and heat in the microwave. 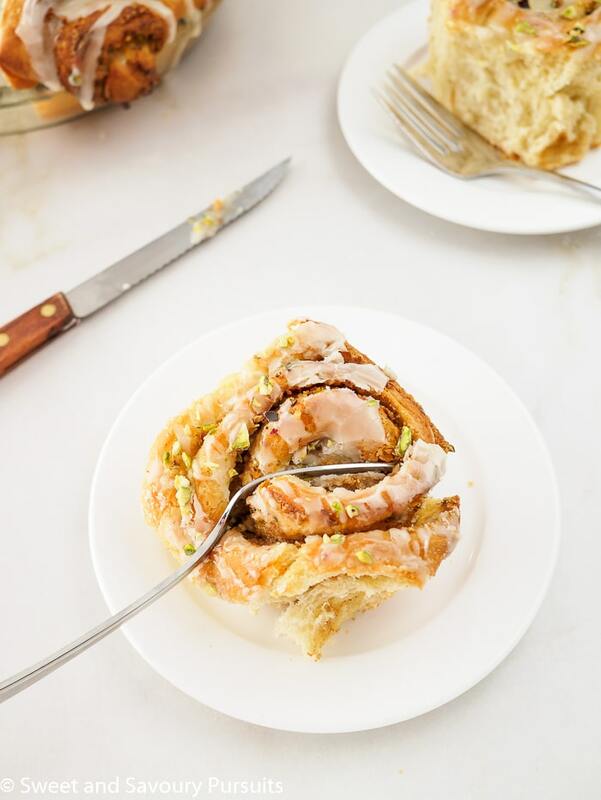 The tahini, cardamom and pistachios makes these rolls stand out from regular cinnamon rolls and is definitely worth the little active time that it takes to make them. These rolls would make the perfect addition to a Mother’s Day brunch! Note that the prep. time does include the rising time. 2 3/4 cups all-purpose flour 345g. 1 tsp. package instant yeast 1 package contains 2 1/4 . After measuring the flour (for the dough) remove 1/2 cup and reserve for use if necessary, you may only need a portion of the 1/2 cup of flour. In the bowl of a stand mixer fitted with a dough hook, stir together flour, sugar, salt, yeast and cardamom. Combine the water, milk and butter in a glass measuring cup. Heat in the microwave on high for about 30 seconds until butter melts and mixture is warm (approx. 115°F or 46°C). Add the liquid to the flour, and combine with the flour mixture. Add the egg and knead on the dough hook for 3 minutes. Add more flour (from the 1/2 cup you reserved earlier) as necessary to create a smooth, and slightly sticky dough. You could also remove the dough from the bowl and on a lightly floured surface, knead the dough by hand for about 3 minutes. Place the dough into a lightly greased bowl and let it rest for 10 minutes. In a small bowl mix the brown sugar, cinnamon and cardamom. To roll the dough, start by lightly flouring your surface and the rolling pin, roll dough to a 1/4 inch thickness. Adding a little more flour if the dough is too sticky. Roll the dough into a 14-inches long and 8-inches tall rectangle. Spread tahini onto dough (leaving a 1/2 inch border on all sides), sprinkle with brown sugar and spices, and top with the finely chopped pistachios. Start rolling the dough from the long end into a tight log. Lightly pinch the seam. Place the log with the seam side down, and using a sharp knife cut dough crosswise into approximately 12 even slices. Arrange the pieces cut side up into a greased pie dish and cover loosely with greased aluminum foil. Let dough rise in a warm draft free spot approximately 60 to 90 min. You could turn your oven on and heat to 200°F, once heated turn the oven off and place rolls in oven. Doing it this way took the rolls about 45 min to double in size. Once the rolls have doubled in size, remove them from the oven (if that's where you had let them rise). Position a rack in the center and preheat your oven to 375°F. Bake rolls until tops are golden, about 20 to 25 minutes, you may want to cover your rolls (with aluminum foil) half way through baking to avoid over browning. Remove rolls from the oven and let cool 10 - 15 minutes. Combine the icing sugar, milk, vanilla extract, freshly squeezed orange or lemon juice and a pinch of salt in a bowl. Whisk until there are no lumps. 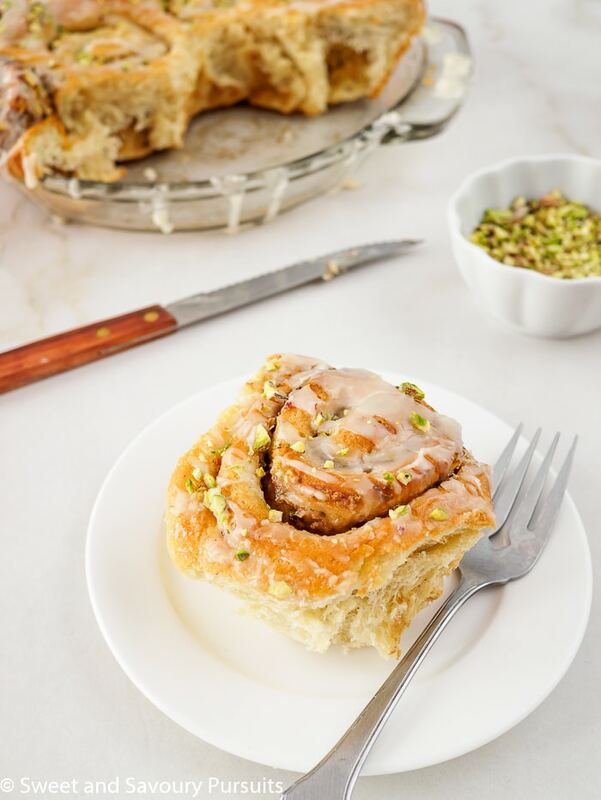 Drizzle the still warm rolls with glaze and sprinkle with additional chopped pistachios if desired. These rolls should be served and enjoyed while still warm. Thank you, it’s one of my favourites. I hope you like it! I never in a million years would have thought to use tahini in cinnamon rolls – this is brilliant! I’m so glad you dove in worked with yeast because the result is incredible! Thanks so much Kathleen, the tahini worked out beautifully in these rolls and they were really delicious! Absolutely love the middle eastern flavors going on in these cinnamon rolls! They look amazing! These look so good. I love tahini, and cardamom, in sweets. Will give them a try. Thanks Louise, they’re so good I’m sure you’ll enjoy them! Wow…what a way to conquer the yeast beast! These rolls look spectacular and your unique ingredients sound delicious! Thanks Nancy, I’m certainly happy I finally had the courage to try my hand at a yeasty dough! Fantastic, saved this recipe. Can’t wait to make it. Thank you, hope you love it as much as I did! These look so incredibly good! I’ve never thought of using tahini in something sweet but now its on my to do list. Love the creativity! Thanks so much Christy. Tahini is delicious in sweets as well!